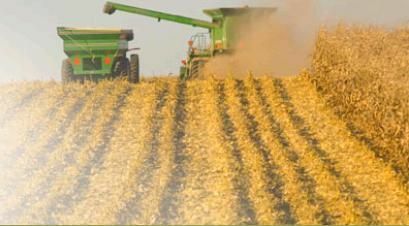 UNDATED - Corn for grain production in South Dakota, based on year-end surveys, is estimated at 737 million bushels, down 11 percent from 2016, according to the USDA's National Agricultural Statistics Service. Yield of 145 bushels per acre is down 16 bushels from last year. Farmers harvested 5.08 million acres of corn for grain down 1 percent from 2016. Corn for silage production is 6.5 million tons, down 7 percent from 2016. Yield of 12.5 tons per acre is down 5 tons from last year. Farmers harvested 520,000 acres, up 30 percent from 2016. Total acreage planted to corn for all purposes is 5.6 million acres, up 4 percent from last year. Soybean production for 2017 totaled 241 million bushels, down 6 percent from 2016. Yield, at 43.0 bushels per acre, is down 6.5 bushels from a year earlier. Area for harvest, at 5.61 million acres, is up 9 percent from 2016 and a record high. Total acreage planted is 5.65 million acres, which is a record high, up 9 percent from last year. Alfalfa hay production, at 2.63 million tons, is down 23 percent from a year earlier. The average yield, at 1.75 tons per acre, is down 0.25 tons per acre from 2016. Area harvested for hay, at 1.50 million acres, is down 12 percent from 2016. Alfalfa haylage and greenchop at 116,000 tons, is down 65 percent from a year earlier. The average yield, at 3.30 tons per acre, is down 3.40 tons per acre from 2016. Area harvested for haylage and greenchop, at 35,000 acres, is down 30 percent from 2016. Seedings of alfalfa during 2017 totaled 125,000 acres, down 25,000 acres from the year earlier. All other hay production, at 2.16 million tons, is up 3 percent from a year earlier. The average yield, at 1.35 tons per acre, is down 0.15 ton per acre from last year. Area harvested is 1.60 million acres, up 14 percent from 2016. All other haylage and greenchop production, at 168,000 tons, is up 12 percent from a year earlier. The average yield, at 4.80 tons per acre, is down 1.20 tons per acre from last year. Area harvested for haylage and greenchop is 35,000 acres, up 40 percent from 2016. Sorghum for grain production in 2017 is estimated at 11.6 million bushels, down 27 percent from 2016. Yield, at 68 bushels per acre, is down 11 bushels from a year earlier. Area harvested for grain, at 170,000 acres, is down 15 percent from 2016. Sorghum for silage production is 407,000 tons, down 22 percent from 2016. Yield of 11 tons per acre is down 1 ton from last year. Farmers harvested 65,000 acres, up 24 percent from 2016. Total acreage planted to sorghum is 220,000 acres, down 19 percent from last year. Oil sunflower production in 2017 is 884 million pounds, down 8 percent from last year. Yield, at 1,700 pounds per acre, is down 240 pounds from a year earlier. Area harvested, at 520,000 acres, is up 5 percent from 2016. Total acreage planted is 540,000 acres, up 6 percent from last year. Non-oil sunflower production of 155 million pounds is up 61 percent from last year. Yield, at 2,100 pounds per acre, is down 50 pounds from a year earlier. Area harvested, at 74,000 acres, is up 29,000 acres from 2016. Total acreage planted is 82,000 acres, up 71 percent from last year. Proso millet production in 2017 is estimated at 1.05 million bushels, down 36 percent from last year's production. Yield, at 39 bushels per acre, is down 2 bushels from a year earlier. Area harvested for grain, at 27,000 acres, which is record low, is down 33 percent from 2016. Total acreage planted is 53,000 acres, up 10 percent from last year. Dry edible pea production is estimated at 525,000 cwt, which is record high, up 9 percent from 2016. Yield is estimated at 1,500 pounds per acre, which is a record low, down 100 pounds from last year. Acres harvested are estimated at 35,000, which is record high, up 17 percent from a year ago. Total acreage planted is 38,000 acres, which is a record high, up 19 percent from last year. Flaxseed production is estimated at 65,000 bushels, down 55 percent from 2016. Yield per harvested acre is estimated at 13.0 bushels, down 3.0 bushels from last year. Acres harvested are estimated at 5,000, down from 9,000 a year ago. Total acreage planted is 6,000 acres, down 40 percent from last year and ties the record low. Safflower production is estimated at 14.6 million pounds, which is a record low, down 22 percent from 2016. Yield per harvested acre is estimated at 790 pounds, which is a record low, down 310 bushels from last year. Acres harvested are estimated at 18,500, unchanged from a year ago. Total acreage planted is 21,900 acres, which is a record high, up 100 acres from last year.